Our wedding planning has started! You may be aware that Vanessa and I have been planning our own special day after I popped the question back in July (Check out the photos of my actual proposal here!) and it is all starting to come together. We are really delighted to be able to head to Rome to tie the knot in May next year, and can’t wait to share our celebration with all of our friends and family! We visited the city back in April this year to view a number of venues as well as meet with some vendors who could help with our day. Rome is such an amazing place and between touring some stunning wedding venues along with sightseeing around the Eternal City our feet barely touched the ground! Outside the entrance to our wedding venue!! Our ceremony will be held in the gorgeous St. Isidore’s College in Via Veneto. It is home to a number of Franciscan monks and filled with history, being officially recognised as a house of recollection and studies back in 1625 all the way through to playing host to Patrick Kielty & Cat Deeley’s wedding in 2012. Our reception will be held in the even more historic Villa Grazioli, built on the hills of Frascati overlooking Rome back in 1580! Adorned in stunning artworks and huge frescoes, it has been home to a number of Cardinals throughout history as well as many families made homeless during the bombing of the town in World War II. It has been gradually restored since the 1980’s and looks absolutely amazing. We still haven’t quite recovered from the awe and excitement the first time we walked through the front door! The excitement of the six-course tasting menu was too much for Vanessa! Given the distances involved, as well as Vanessa and my complete lack of Italian (we’re learning though!) 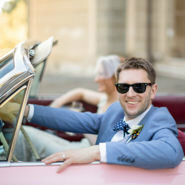 we needed a wedding planner to deal with the legal aspects of getting married in Italy and have loved working with Louise from Weddings In Rome. She has guided us through the various legal and religious aspects of the marriage as well as introducing us to a number of suppliers, making the whole planning process much much easier! We don’t always agree on our afternoon drinks while on holiday! 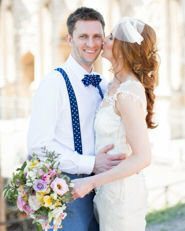 It’s still early days for us in our wedding planning process but it is really interesting to see everything from the perspective of my couples, the thrill of planning our wedding, the nerves about ensuring everything goes smoothly and the excitement to be spending the rest of our lives as Mr & Mrs Love! …and sharing it with the hundreds of other tourists who also thought it would be tranquil and relaxing! I know Louise, it’s been so exciting so far, can’t wait to get stuck in and see everything come together! Sinead, friend of Vannesa from her days in Dublin. Thank you so much! Vanessa is delighted to hear from you and congrats from both of us to your parents on their 40th! We’re trying not to think that far ahead for ourselves, we’ll be in our seventies! !